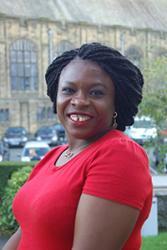 Dr Ama Eyo.A Bangor University lecturer has been shortlisted for the prestigious Law Teacher of the Year award. With an exceptionally high standard of nominations from universities around the country, the judging panel had a tough job selecting the final shortlist of six. The judges will return to Bangor University for the rigorous second stage of the judging process, as Ama Eyo’s colleague, Sarah Nason at the Law School was shortlisted for last year’s competition, underlining the high standard of teaching at Bangor University’s ten year old Law School. Ama is the Director of Bangor LLM in Public Procurement, where she has developed innovative teaching methods to excite students’ passion for the law and strategy of public procurement at the Law School's leading procurement law centre, the Institute for Competition & Procurement Studies. Ama also teaches Company Law and Tort at undergraduate level, and originally hails from Nigeria and holds her PhD from Nottingham. “I am extremely delighted at this excellent news and as it demonstrates the validation of the relationship my students and I have tried to create over the years, the exceptional contributions my colleagues and students have made to my teaching, and a testament to the excellent level of engagement between lecturers and students at Bangor University. Over the last four years of my academic career, the University and Bangor Law School have provided me with a range of unique teaching opportunities and skills, and I am grateful that my students have helped me to develop and hone these skills through their dedication and engagement in class. Joining Ama Eyo on the shortlist are Paula Blakemore, The Law Academy and Birkenhead Sixth Form College; Emily Finch, University of Surrey; Jane Holder, University College London; Esther McGuinness, University of Ulster and Nick Taylor of the University of Leeds. The winner will be announced at an awards luncheon in Oxford on 27th February 2015. Ama Eyo’s nomination is the latest in a series of major developments at Bangor Law School which underline the tremendous progress made at the School in the ten years since its inception.